You are looking at an exotic and scarce model made by Detroit Radio under the trade name Detrola. This particular model has a unique form factor and is a pretty decorative piece. The radio offers an oversized and highly detailed dial with the major clear channels and shortwave capitals clearly marked. 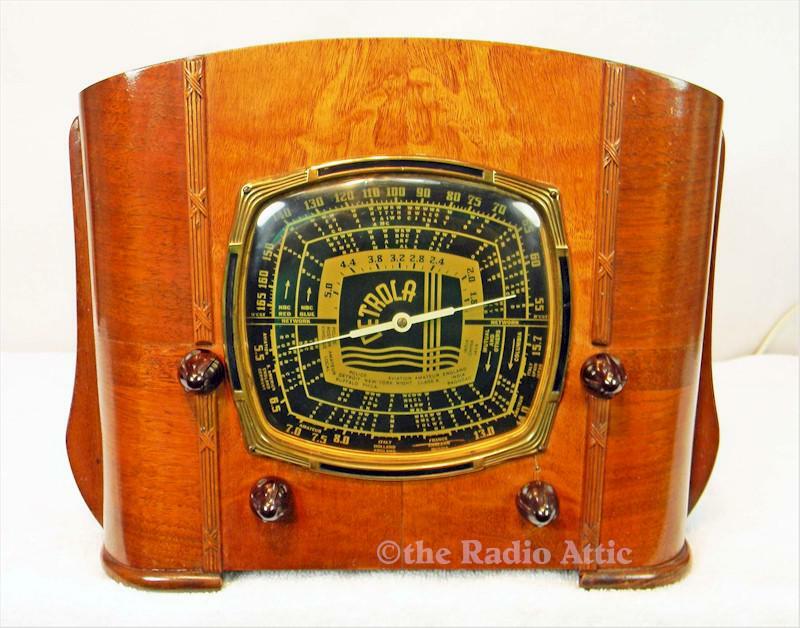 The radio does offer both broadcast and shortwave playing in a terrific manner off a six-tube super-het chassis. The condition of this example is tremendous and completely original. The radio is so pristine, it still retains the factory installed back, something I have never seen before! You will never find a better example! Les has done his professional repairs to the electronics and the radio plays again in the fine fashion as new. With his repairs was his addition of a mini-jack for your connection of any type of modern device or add a Bluetooth receiver to the package for only $25 additional! 14-3/8"W x 11"H x 8"D.
You are visitor number 919 to this page.